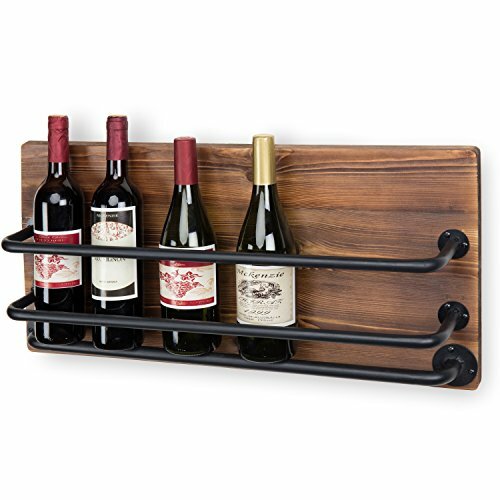 Serving as both a dramatic decorative piece and functional storage for up to 7 bottles, this rustic wine rack adds a rugged accent to nearly any drinking area while keeping an evening's selection at hand. Featuring an antiqued wood finish and stout metal pipes, this sturdily built rack complements industrial- and lodge-style decors nicely, and the open design keeps each bottle easy to identify. Also useful in bars and wineries, this rack offers a stylish way to present wine menu offerings to guests, or to keep opened bottles organized for serving by the glass. SPECS: Overall -12.8 H × 26.5 W × 4.9 D; Space between two top bars and wood - 3.8 D; Bottom bar - 1.7 D; Space between the top to bars -3.2 H; Bottom to middle bar - 2 H.
7-BOTTLE WINE RACK: Wall-mounted rustic style wood and black metal pipe-inspired wine bottle holder. DECORATIVE & FUNCTIONAL: Add charm to your dining room, wine cellar or kitchen to perfectly display your favorite wine and spirits.